Volusia Counties only Local Fundraiser! 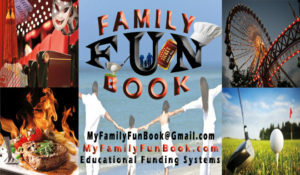 The Family Fun Book was created for the purpose of providing schools and other non-profit organizations with a simple, risk-free fundraising system, as well as a product that buyer will love. By working with the family fun book you will have an easy and profitable fundraiser experience and also help our entire community. Our coupon book contains hundreds of amazing coupons for locally owned venues that cannot be found anywhere else. When your fundraising customers use these coupons not only are you saving them money, you are also helping a local business find a new customer. The local fundraiser benefits, the local coupon book customer benefits, and the local business benefits is a win for the entire community. If you are looking for a fundraiser in Port Orange, Daytona Beach, Ormond Beach, New Smyrna Beach, Edgewater, Holly Hill, DeLeon Springs, Deland, Deltona, Debary, Bunnell, Flagler Beach, Lake Helen, Orange City or Palm Coast please give us a call today! THEY ARE HERE!!! 2018 VOLUSIA COUNTY FAMILY FUN BOOK AVAILABLE NOW! The Family Fun Book helps our community is many ways. We are a local, family-run business which has been serving the Volusia County community for over 25 years. The business is currently owned and operated by Amanda Manley, first grade school teacher, and her brother Robert Ross, an already successful children’s business owner. Educational Funding Systems was founded in 1991 by a retired teacher from the Volusia County School System, our goal has always been to support the community by partnering with local businesses, schools, churches and civic groups. When you purchase a Family Fun Book or use it as a fundraiser, you are helping support local businesses and in return, these businesses provide coupons in our book to support our community fundraisers. My Family Fun Book Copyright © 2019.